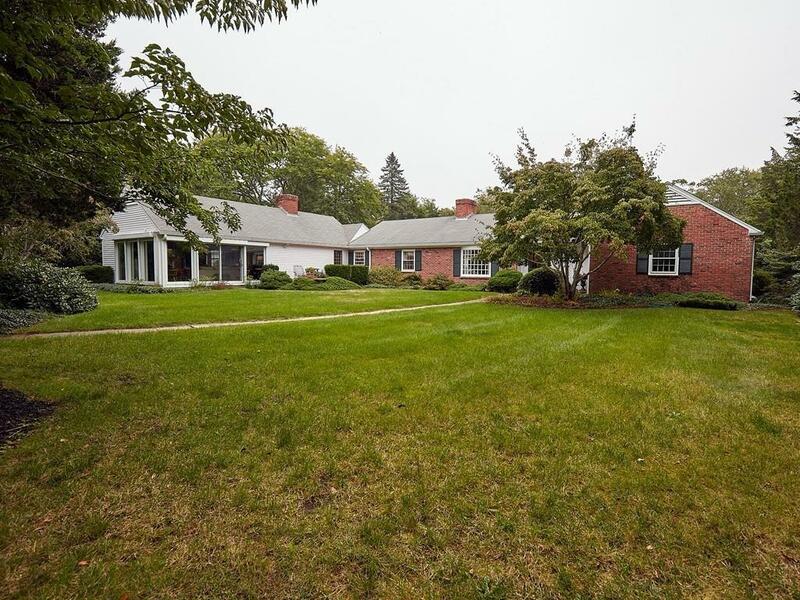 SOUTHCOAST GEM: Historic Westport Point area of Westport,MA.Classic, custom-built, one-level brick home,minutes to town dock,marina, ocean beaches & water-view dining.Peaceful,secluded site,w 3 acres of stone walls,walking paths filled w rhododendrons,azaleas, & ornamental trees.Enjoy views & access to courtyard fm a 20x40 family rm w 2 walls of glass, FP, deck,bookcases & built-ins.Spacious applianced kitchen w soapstone counters & add'l bar sink.3 bed,2.5 baths,studio, tiled laundry room, lv rm w FP, din rm w built-in cabinets on main level,1 bdrm & full bath on lower level w marble floors.Timeless details & hardwood floors throughout . Nearly 3,000 sq.ft.country retreat w 3 zone natural gas Carrier Heat and AC system,new 22kw generator & 200 amp elec.Large screened porch with flagstone fl FP w access fm dng rm & lv rm.2 car gar. & large shed. Martha's Vineyard living on mainland w/o crowds, traffic and hassle. Easy hwy access to nearby Cape Cod, Newport, Providence & Boston. Listing courtesy of Lindsey Bshara-Leviss of Salt Marsh Realty Group. Disclosures Owners Are Licenced Ma. Real Estate Brokers. Listing provided courtesy of Lindsey Bshara-Leviss of Salt Marsh Realty Group.